On Broad Street, on the fortified wall next to the Square Tower. 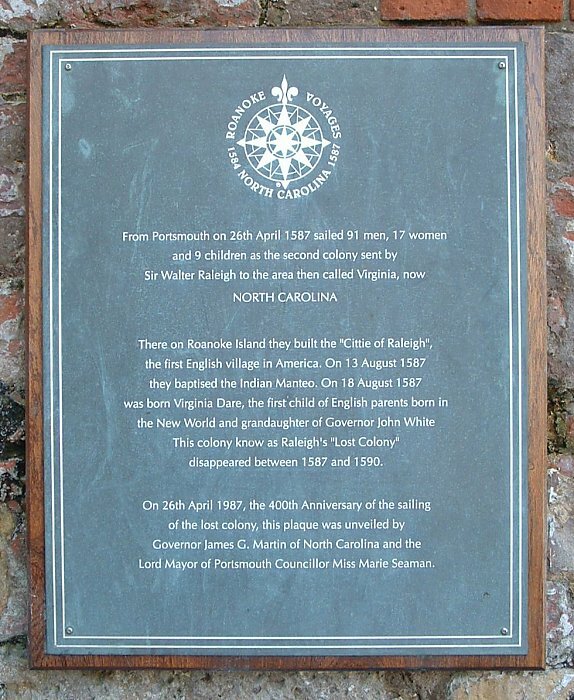 There on Roanoke Island they built the 'Cittie of Raleigh', The first English village in America. On 13 August 1587 They baptised the Indian Manteo. On 18 August 1587 Was born Virginia Dare, the first child of English parents born in The New World and grandaughter of Governor John White. This colony know as Raleigh's 'Lost Colony'. Disappeared between 1587 and 1590. 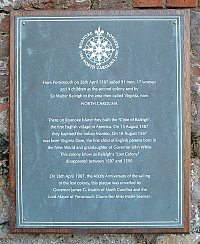 On 26th April 1987, the 400th Anniversary of the sailing of the lost colony, this plaque was unveiled by Governor James G.Martin of North Carolina and the Lord Mayor of Portsmouth Councillor Miss Marie Seaman. There is also a novel on this subject by Giles Milton entitled 'Big Chief Elisabeth'.